Meanderings and Reflections: How personal can the virtual become!?! When I told my friend that I was going to attend a bloggers meet on Sunday, she asked me, "Why?" I couldn't understand the reason behind her Why. I tried to give her many answers in the line of, "Isn't it wonderful to connect with people whom you have only virtually met?," "Come on, it's fantastic to meet those people whose writings one has followed and admired." My friend was unmoved. She replied, "Why on earth do you want the virtual to become real?" Well, I muttered, "We want to extend the relationship of the virtual into the real. Who knows, we might also become best of friends." 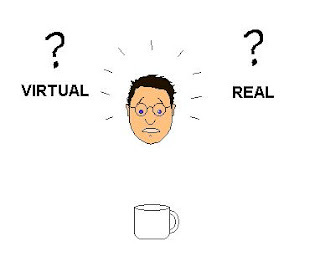 Still not convinced, my friend said, "Let the virtual be virtual and the real, real." I couldn't have the last word because I didn't know what to say. Much thought has gone into the topic of virtual relationships. Today many of my phone contacts are people whom I had befriended over blogs, Facebook and the then Orkut. I interact with them, share thoughts and call them up to just have friendly chats but does that mean I know them up, close and personal. I don't know many of them personally. Perhaps I would know their addresses, their birthdays and their favourite food but does that mean I would call them when I am in a very bad situation. Will I reach out to them when I need some financial assistance or a shoulder to cry on? Well, no. The reasoning, "But I haven't met them for real" will always be somewhere on the back of my mind when I think of even seeking any favour, no matter how small. Are virtual relationships only for good times and a pat on the back in terms of "like" or do they even go beyond that? I have been writing hand-written letters to some of my blogger friends since I enjoy writing letters. Does that mean that I am very 'close' to these bloggers. Perhaps, I have that extra special liking for those individuals who seem to radiate warmth and joy through their words on their blog and Facebook page. Am I very 'close' to them? I cannot say. Will I tell them that a certain X has broken my heart and that I am down in the dumps? Will I talk to them about my financial anxieties? Maybe I think, "What will they think of me if I start unloading on them?" What is the nature of these 'friendships?' How personal can we get to our virtual friends? Here, I should also mention that I have had a handful of virtual friends with whom I have become very personal. But when it comes to comfort levels, nothing can beat a face-to-face conversation, says my friend. I beg to differ with her because I think there are different levels of virtual friendships - some shallow and some very deep. It is because we believe that the virtual will lead to real and lasting relationships that we are quite eager to meet in person and interact. But some, like my friend, would like the virtual to be virtual and the real, real. My dear reader, what do you think of this topic. How has the virtual life mingled with your real life? Do you think that the virtual and the real should be separate? I think virtual life has mingled in my real life to a certain level in that I've got some really wonderful friends on FB to whom I can turn for advice most safely. I don't know whether I'll ever meet them or not because they are from far away countries yet it doesn't matter.Are all so-called 'face to face' contacts always satisfying?In most of the families the members hardly share their thoughts with each other.Even my own dad doesn't have much time for me. All the conversations in the house are mostly in mono-syllables!They aren't interested in my writing or painting. It is better then to open out with some caring VF(virtual friend). Portia, I completely agree with what you have said here. When real people don't have time for us, we often find comfort and warmth in online friends and sometimes inspite of the real, the virtual is a blessing since we spend a lot of our time online. And as for your paintings, they are beautiful. We love you dear Portia. Thanks for coming by and stopping to record a comment. Well Susan, you know the story between me and Zuzana, so I know a virtual friendship can become a reality. Well I think that depends on you yourself, how personal you want to be , and yes this question has troubled me a lot too, But then I am not that bright and I have the same feelings for everyone. I can say that the ones who i call FRIENDS, I give same important to them be it REAL or be it Virtual.. although I will also add that sometimes the expectations that we have from friends are not met with VIRTUAL ones .. I do chat and talk with a few bloggers and over time we have become closer and we have opened up. plus these days virtuality is becoming more real, I have met some bloggers from different countries and we have hit on so veyr well. I have met some wonderful people with diverse interests, online. I value and treasure them as I do my offline friends. We choose friends online as we choose friends in real life. We vibe well with some, not so with others. I must tell you that blogging is the best thing to happen to me so far. I have made some awesome virtual friends who are non-judgmental...warm. This maybe because we have not met and this may change if we meet too. But, I have bonded with some bloggers face to face and I do not regret it at all...they have touched me deep. Completely agree with what you have said. I'm nodding in affirmation. Only love and nothing more. Muaaahs and thanks for being a lovely pal. i realy think that we have far more of a chance of meeting and making like-minded friends online, than in the real world as our choices are not so restricted to just our immediate circle online but we can range far and wide. and as for those who hesitate to take the virtual into the real, well not everyone are honest online and sometimes the fear of reality makes the person hesitate to change the virtual into real. And you and me are great examples of being online-offline friends!!! thanks Doktor for the warmth and fun! Susan, I cant say my virtual and real worlds are very different. In the virtual world I am close to the people who I am sure I wud have been in the real world too! Dear Susan, as always interesting subject. ;) Maybe those of us who recall time before internet and www will always distinguish between the virtual and real. The kids today combine these to into a novel reality. I am also like you and in fact I connect to online friends more than I do with real ones!! Have a great week ahead, dear Zuzana and thanks for being a wonderful online friend. When you stay in a new place with not many friends and informal relationships, the virtual world is a big boon...It makes you feel so close to home...Only thing, its a little risky....Of course not in the case of networks like Indi, ChennaiBloggers etc...But say its a one-on-one meeting between two virtually met people, there is a possibility of being taken for a ride rt? What do you think? Spot on, J. I agree that when one is far from home, online friends are a great succour. First, thanks for subscribing to Wisdom and Life. I know I don't get here as often as I should. I 'll do better. I've met a few bloggers who I connected with online first and I've always come away with a positive feeling. It's been fun discussing our similar experiences and topics we write about. Good for you that you want to meet the people you only know through blogging. Chris, it's okay if you don't get here often. All of us have issues of time. Ah, I have met several people and as you have mentioned, it has been fun discussing different stuff. Glad to have you stop by, Chris. What marriage . . . what about us!?!? We get along very well inspite of not having met. I would love to meet you someday, sweetest and I am glad to have found you. I think it all depends on the level of the relationship. Also, it depends on the topics written and discussed online. Some subjects segue more naturally into deeper bonds and more intimate sharing. If that ongoing communication develops, I say meet live if that’s the mutual desire. Personally, I’m content with the online conversations. Seeing some of these friends face to face would be interesting, though, I’m sure. Glad to see you, Debra. Hope you are well. I have met and interacted with many of my online friends and I must say that we go along like a house on fire. All said and done, we interact and connect but not on a deeper lever. Deeper levels are only for some online pals, not everyone. Oh yes, it is definitely wonderful to connect with online friends in the real world. As someone elsewhere in the comments mentioned, we do pick and choose our online friends as much as we do our offline friends. I think it's nice when one develops meaningful friendships in real life with people we've met online. I've only met one person in real life so far. That was on a professional rather than personal level. I'm a little bit cautious because I've heard some scary stories. One such story is currently creating shock waves in the Nigerian onine community which is not that different from many others. A beautiful young lady met up with a facebook friend after they had chatted online for two months or more. He turned out not to be a friend. She was raped for 12 hours in a hotel and strangled thereafter. We can't be too careful. But then again, there are some beautiful people out there. I guess one has to know as much as possible about the person before meeting in real life and even then, take the usual security precautions one would when meeting with a total stranger. I think the worry is that social media creates an artificial sense of security - that we know people because we've been talking to them - when in fact we probably don't know much about them. After all, people can be whoever they choose to be online. It helps of course if we know people in real life that know the person we've just met online. Just to add: I don't think one has to keep the real and the virtual separate. It depends on what it is. But I think safety is paramount whatever the issue might be. Sometimes boundaries are necessary. And one must always be aware that not all people play by the same rules of honesty and 'keeping it real' so to speak. Some people create completely new identities for themselves including a virtual gender change! Yes, I've seen it happen. The irony is one can't really know who they really are until one meets with them and really get to know them. Taking risks with precautions, I guess. One has to be wise and practice caution. Most of the friends I have on Facebook are my blogger friends with whom I have interacted for several years online as well as over the phone and hand-written letters. Thanks for coming by dear friend. Glad to see you here. Have a great week ahead. ten years ago I would have replied as your friend, "what??? how can you be friends with someone you've never met?" today I must say that one of my closest friends I met through blogging. Yes, we did meet in person and now talk on the phone and see each other when time and distance permits. There are some bloggers I have talked to on the phone and I could easily transition from online to personal if I dared vacation where they live. Can I be best frends with someone I've never met? hmmmm maybe, provided there is verbal communication. The virtual and the real become one sometimes. You're right Myriam. I have many friends who are from the virtual world and I am also glad that you are one of them. Thanks for being a friend. Did make a lot of friends through Orkut from a particular group. We are still in contact even though Orkut is almost dead. Once when we were planning a visit to Bangalore, the first question that one of the members asked is "do you have a place to stay? If not you are welcome to stay in our our house"
Thanks for stopping by thought I would have preferred to have known your name. An anonymous person is a non-person without an identity and hence unreal! But your question got me thinking. Glad that you stopped by to record your insight.